Welcome to the website of the Yorkshire Helicopter Preservation Group (YHPG) . The Group is a Volunteer run organisation and exists to preserve and maintain helicopter air-frames and artifacts relating to rotary wing operations and display them in the Yorkshire Area. It was in July 1994 that without realising it Ray ‘Mac’ McElwain inadvertently started YHPG. It was during this month that Mac moved Westland WS51 Dragonfly HR5 WH991 from its long term resting place at Melbourne Autos near York so that a full restoration could be effected and the resultant historic aircraft could be placed on display at a nearby local aviation museum. During the restoration Mac gathered a team of very willing volunteer workers who during the four year restoration learned some very valuable aircraft engineering skills. With the official rollout ceremony due on the 27th September 1998 the tem members were at a bit of a loss as to what to apply their hard earned skills to next. We knew that at the Dragonfly’s former home Melbourne Autos there also languished a former RAF Westland Whirlwind MK10 which had last served with B Flight, 84 Sqn in Cyprus. Enquiries were made regarding its availability, but its owner Jim Smith had become very attached to XP345 during its sojourn at his premises and couldn’t be persuaded to part with it. Following further discussions Jim kindly agreed to allow us to restore the aircraft to its former glory for him in exchange for a suitable loan agreement to allow us to put it on display. Further investigation discovered that XP345 had a very interesting history having served in training, search and rescue and support roles. 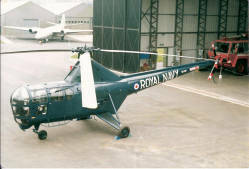 In order to give the team members an identity it was decided to formalise their operation and the Group was formed under the title The Yorkshire Helicopter Preservation Group (YHPG).Soon afterwards we were also given prototype Whirlwind Mk10 XJ398 by Oxford Aviation College to ensure its survival following its retirement as a training aid. Our hosts at Elvington did not wish to continue to accept the housing of independent groups and so the decision was made to search for a suitable home for the embryo YHPG. It was here that fates collided, the South Yorkshire Aircraft Museum (SYAM) had recently moved their collection from Firbeck near Rotherham to a remaining part of the former Doncaster Airfield in South Yorkshire (wartime RAF Doncaster).The site consists of a wartime Bellman hangar, two extensive wartime wooden buildings and a modern workshop / stores building (ex York’s Water) plus a number of smaller structures around the site. The museum had been named Aeroventure by SYAM. Following a presentation by Mike and Alan to the SYAM committee our request to make our home at Aeroventure was accepted and early on Saturday 14th July 2002 the move was smoothly made with a number of vehicles and trailers heading south down the A1 arriving at our new home around lunchtime. We had by this time amassed quite a collection of spares and equipment to house. By agreement with our new friends it was decided that we could modify an existing building for use as our workshop and use a small portacabin for storage. Within approximately nine months the workshop was complete and XP345 was made ready for its restoration to be continued. There was a brief pause in our labours during the workshop construction phase when Whirlwind Mk1 XA870 was donated to us by Flambards but the story of this can be found elsewhere on the website as can all our news archive from the past ten years which will bring you fully up to date with our progress. YHPG do what our motto claims on our crest ‘Restore and Preserve’. We are always looking for willing volunteer workers (skilled or not, we all had to learn once) to assist in our projects. If you think you would like to join in please don’t hesitate to contact us. You will be sure of a warm and friendly welcome at our Aeroventure home. We are an entirely volunteer run organisation and as such have no regular income. The restoration of helicopters is an expensive undertaking and we rely heavily on our supporters to assist us with donations and contributions. If you feel you can’t spare time or are not physically able to help us but would still like to offer your support in some way you might like to consider a donation or sponsorship with specific items, if this is the case please don’t hesitate to contact us to discuss your offer. To preserve and maintain all our aircraft and artefacts to the highest exhibition standard possible. 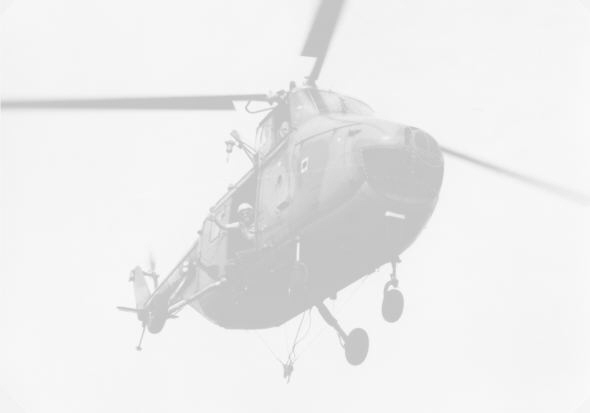 To continue to expand the group’s current archive, adding items relating to all helicopter operations by all three services and civilian users. To add helicopters both military and civilian to the collection as availability and funds permit. To offer advice and assistance relating to rotary wing aviation to schools and individuals. Whirlwind hydraulic system training aid constructed from whirlwind gearbox, rotor head and tail rotor components by Bristow’s trainees (at Bristow’s training school). It has been given the fictitious registration ‘G-YHPG’. Napier Gazelle turbine engine ex Wessex Mk1. The group hold an extensive archive of pictures and information relating to its charges, also a complete set of maintenance manuals for the Whirlwind Mk10/12 and miscellaneous manuals for the Whirlwind Mk1 , Dragonfly , Wessex and Sioux. The Group exists through the voluntary efforts of its members and the donations of it’s supporters without whom we wouldn’t exist. If you wish to contribute or sponsor any aspect of our current projects please contact the group.